EPSI’s Flangeless Plug (FLPS or FLPE) product line is specifically designed to mask threaded holes, including the top thread, without masking the surrounding area. The tapered ribs and hollow core allow for many different size holes to be masked, regardless of the thread pitch. Imitation plugs have rounded ribs that do not offer the same degree of protection as EPSI’s FLPS line. Made of a rugged blend of our High Temperature Silicone the FLPS has excellent sealing characteristics and reusability.Tapered ribs and hollow core allow for masking of multiple sizes of holes. Sharp rib profile offers excellent chamfer coverage. Specially Formulated to be rigid. Allowing plug to be pushed into place. Used as a plug for threaded holes, including the top thread. 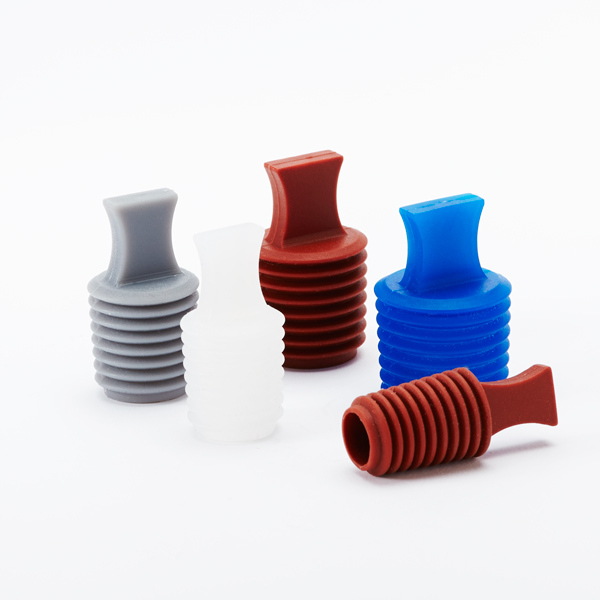 Silicone Flangeless Plugs are designed to be inserted via direct pressure. EPSI does not recommend threading these plugs into place, as threading may cause damage to the plug and difficulty during removal. Due to the low tear resistance of Silicone, do not use tools (such as pliers) to remove plugs. 0.157 Major Dia. X 0.079" Min"
0.236 Major Dia. X 0.157" Min"
0.315 Major Dia. X 0.236" Min"
0.394 Major Dia. X 0.315" Min"
0.472 Major Dia. X 0.394" Min"
0.551 Major Dia. X 0.472" Min"
0.630 Major Dia. X 0.551" Min"
0.709 Major Dia. X 0.630" Min"
0.787 Major Dia. X 0.709" Min"
0.886 Major Dia. X 0.787" Min"
0.945 Major Dia. X 0.886" Min"
1.024 Major Dia. X 0.945" Min"
1.102 Major Dia. X 1.024" Min"